Through public programs and exhibitions, restoration of its landmark building, and conservation of its original collections, the Museum educates the public about the domestic life of a wealthy merchant family and their four Irish servants, 1835-1865, when the mercantile seaport of New York City emerged as a growing metropolis. The Museum’s collection of over 3,000 items comprises the possessions of the Tredwells, the wealthy merchant-class family who lived in the House from 1835 to 1933. The collection includes furniture, decorative arts, clothing, photographs and books, household items, and personal items. Highlights include a suite of 12 mahogany side chairs attributed to renowned furniture maker Duncan Phyfe, a pair of matching six-globe gas chandeliers, and 40 dresses and numerous fashion accessories that belonged to the Tredwell women. 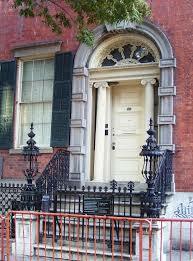 The Merchant’s House Museum is owned by the City of New York, operated by Old Merchants House of New York, Inc., and is a member of theHistoric House Trust. M1 to Broadway and 8th Street.